The REHAU TOTAL70 Window Frames and Door Systems comprise of a range of multi-chambered profiles that are designed to meet the requirements of the new build, commercial and domestic refurbishment markets. For casement windows frames there are two aesthetic options to choose from. REHAU TOTAL70C is predominantly a Chamfered system with a part sculptured ‘T’ Sash option. This chamfered system is simple yet elegant, helping to create our beautiful contemporary frames. REHAU TOTAL70S is a suite of fully Sculptured profiles offering heightened style to both modern and traditional properties. Crafted using PVC, both systems guarantee maximum energy efficiency and performance for your investment. 70mm depth of window frames allows for the replacement of 3″ timber frames with less trimming up. Safety and security. 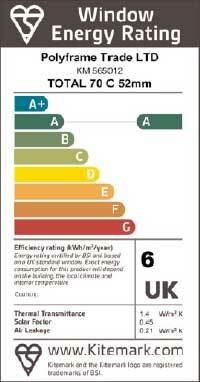 REHAU TOTAL70 window frames and door systems can achieve the British Standard BS7950 and PAS 23/24 security standards. The multi-internal chambers allow further installation of larger steel reinforcements, if required.